Use the Gameboard and Blocks to build your first character. 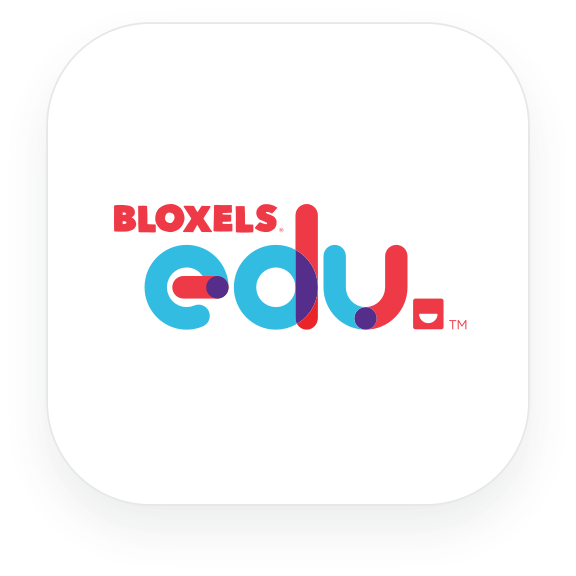 In the Bloxels EDU app, capture and edit your characters colors and animation states, and share with your class in the Class Library. Tap the BUILD button on the Home Screen. Tap the CHARACTERS button on the Builder Screen. In the Character Builder you can view all the characters you’ve created in your Library. Tap the CREATE NEW CHARACTER button to create a new character or tap on an existing character to OPEN. In the Character Builder you can Capture a character from the Bloxels Gameboard, edit the colors using the Color Wheel, and animate its Idle, Walk, and Jump states. In your characters IDLE state, tap the + button on the right of your frame to create a second frame. In the second frame, use the Undo, Redo, Erase, Copy, and Paste buttons, transformation arrows, and the Color Wheel to edit and animate your character. Maybe its eyes are blinking, or its shrugging its shoulders. You can add as many animation frames as you’d like in each of your characters states. Use the slider on the bottom left of the screen to adjust your animations speed. To slow your animation down, slide it to the left, to speed your animation up, slide it to the right. You can view your characters animation to the left of his Idle state. Tap back on your characters first frame, then tap the COPY button, to copy your character to your clipboard. Use the Undo, Redo, Erase, Copy, and Paste buttons, transformation arrows, and the Color Wheel to edit and animate your character to look like it’s walking. You can tap the green PLAY button at any time to test out your characters animation states. Tap the blue EDIT button to get back to the Character Builder. Tap the COPY button, to copy your characters frame to your clipboard. Use the Undo, Redo, Erase, Copy, and Paste buttons, transformation arrows, and the Color Wheel to edit and animate your character to look like it’s jumping or flying. Don’t forget to give your character a name! Tap the COGWHEEL to open up the keyboard and type in your characters name. Tap the CHARACTER icon in the top navigation menu to return to your Character Library. Tap the OPEN LAST EDITED button for quick access to your most recently edited character. Tap on a character to OPEN the Character Builder, SHARE with your Class Library, or DELETE from your Character Library.